Home / Automotive / Cars / Video: Could The Renault Ez–go Overtake Uber? Renault prides itself on making a wide variety of cars to cater for all budgets and tastes – and this year's Geneva Motor Show was no different. The autonomous EZ-GO concept car was created to seat 6 people in a driverless UberPool vehicle that users will be able to summon via mobile app or roadside station. If the EZ-CO passes the concept phase, it will essentially create a new form of public transport, which can be summoned by an individual or a group, and integrate the passengers into the existing route in the most efficient way based on the other passenger's routes. Patrick Vergelas, head of Renault Mobility services, said that Renault won't sell the actual car to consumers but intends to sell it as a service. The car is mainly created for urban use and will be deployed by public transport companies. Prices are estimated to be slightly more expensive than a bus ticket but significantly cheaper than an Uber or Lyft. This would mean that Renault itself would have to change its whole business to become a service provider instead of a car company, but Vergelas says that the transition is well underway and that it is the most promising and logical end point of their current direction. The EZ-GO has been designed to specifically diverge as far as possible from the trends in car design with its elongated rear and metal clad wheels. Instead of the standard two or four metal doors with a window, the EZ-GO has a huge glass door that lifts from the front of the car with a ramp that caters for the disabled. The interior is littered with charging stations and coat hangers in convenient places, with glass panels lining the car to maintain the open, outdoors feel. 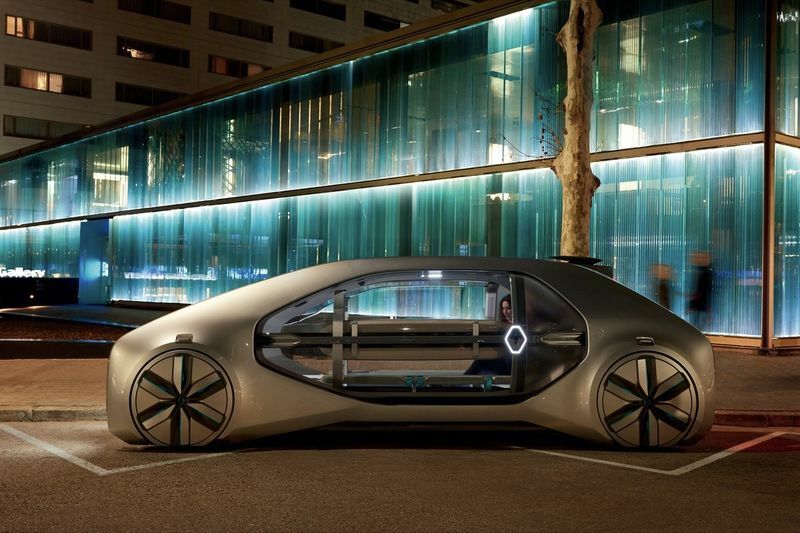 With the hopes of designing the car to a level 4 autonomy, Renault hopes to have robo-taxis transporting people by 2022. The car concept itself can be described as affordable and forward-thinking and the technology of the concept is thought of as shared, connected, urban, autonomous, and all-electric.